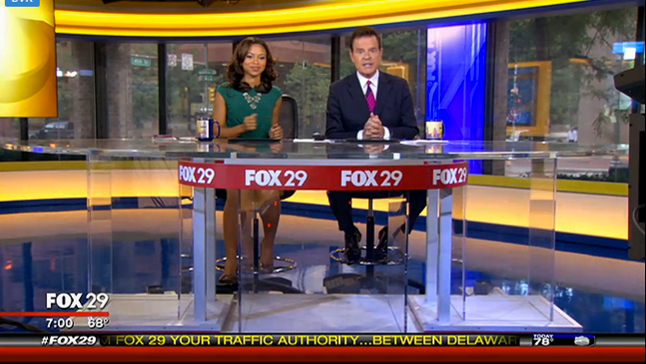 Philadelphia‘s WTXF-TV has debuted a new set in its streetside studio. The set replaces the 2006 FX Design Group set that featured faux metal trusswork, bright red accents and suspended frosted panels. The new set relocates the anchor desk to the center of the studio, rather than the corner where the previous one was located. Behind the desk, a vertical flat panel video screen covers an external structural support, while another is mounted on the column in the middle of the studio. 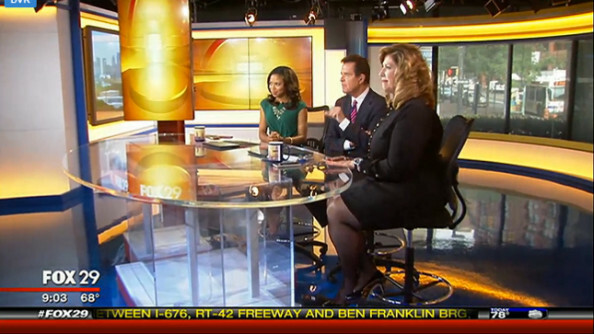 As NewscastStudio learned during its visit to the set shortly after its debut, that column is load bearing and can’t be easily moved, though it appears this new design features a significantly slimmed down version. 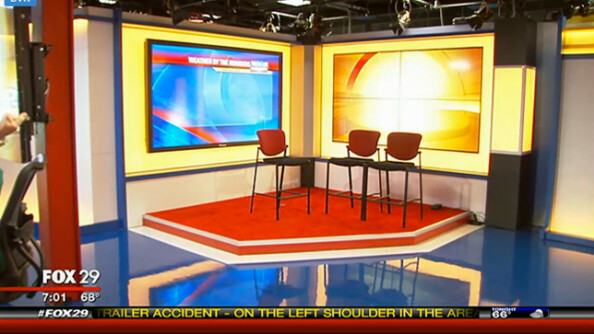 The set, designed by Philadelphia-based Erector Sets, also includes a 2×2 video wall and single wall mounted flat screen to the left of the anchor desk that also serves as the background for an interview area. The new look is a departure from the previous look — with a see-through glass anchor desk with a printed graphic banding. The set also includes off-white walls that are illuminated with color changing lights, including along the knee wall under the set’s windows.